“As kingfishers catch fire, dragonflies draw flame” is a poem written by religious poet Gerard Manley Hopkins (1844-1889). According to the Broadview Anthology of Victorian Poetry Hopkins wrote “As kingfishers catch fire” in 1881 or 1882 (Collins 1049), but it was not published until almost thirty years following his death. In 1918 Hopkins’ friend Robert Bridges, who was Poet Laureate at the time, published the first edition of Hopkins’ collected works, Poems of Gerard Manley Hopkins First Published. With reference to Hopkins’ letters to Robert Bridges, Elgin W. Mellown claims there was only one print-run of Poems in 1918 consisting of 750 opulent copies of Hopkins’ poems printed on high quality paper, whose latter pages were filled with reproductions of Hopkins’ manuscripts (Mellown 39). Mellown also notes that the price of the volumes were “at twelve shillings and sixpence, roughly two or three times the average cost of a book of poetry in the years 1916-20” (39). 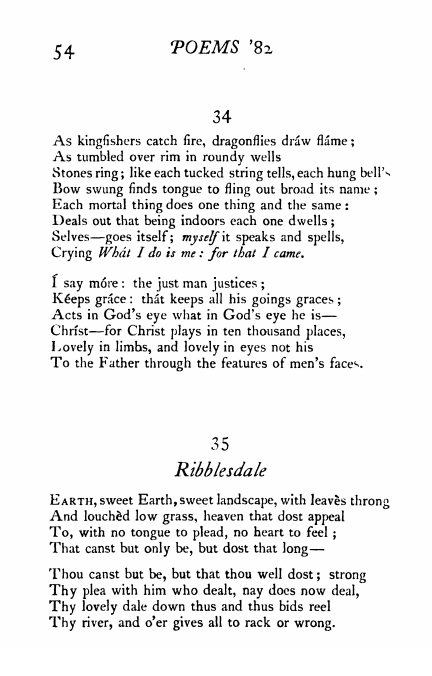 Although Hopkins’ poems were circulated in 1918, they received little critical praise until the second edition of Poems was published by Charles Williams in 1930. Mellown attributes the success of this later edition to “the slow growth of Hopkins’ reputation in the 1920’s” (38) during which time a number of prominent literary critics “emanating from Oxford and Cambridge” reviewed his work (46). “As kingfishers catch fire” adheres to the verse form and rhyme scheme of a traditional Petrarchan sonnet. However, Hopkins subverts the sonnet form by using rhyme in unexpected ways. Cross rhyme as in “wells” (2), “tells” (3), and “bells” (3), and caesural rhyme as in “fling” (4) and “thing” (5) as well as internal repetition of words such as “God’s” (11) and “Christ” (12) upset the sonnet’s typical terminal rhyme scheme. The rhythm also belies the established sonnet form. The meter of “As kingfishers catch fire” departs from running rhythm, which is “the conventional English poetic metre, characterized by the use of feet of two or three syllables, the principal stress falling on the same syllable each foot” (“running rhythm”); instead, “As kingfishers catch fire” is written in Hopkins’ characteristic “sprung rhythm.” The “Authors Preface” to Poems suggests that in its variance sprung rhythm mimics the rhythm of natural speech (Hopkins 5). It goes on to state that sprung rhythm consistently places stress on the first syllable of each foot, and allows for metrical feet of varying length (1-4 syllables) that follow in unpredictable order (4). While on the one hand Hopkins undercuts the traditional sonnet form, he also hearkens back to the tradition of metaphysical poets, like John Milton, whose work was influenced by contemporary scientific discovery and dedicated to understanding the natural world. “As kingfishers catch fire” begins with a sequence of vivid sensory images that depict moments of dynamism in the natural world. The opening visual images of kingfishers aflame and dragonflies leaving trails of light in their paths in the first line of the poem encompass swift movement that in an instant, and from a certain perspective, “flame[s] out” (“God’s Grandeur” 2) in a sudden manifestation of nature’s exuberance. According to Daniel Brown, nineteenth-century scientific developments in “[s]pectroscopy provide[d] Hopkins with an apt analogy to describe his ontology, which values individual difference as an expression of God’s nature” (Brown 153). The bright line associated with the resonant frequency on a spectroscope is an iridescent signifier not unlike Hopkins’ lively images that illustrate a particular moment of sublime beauty. The cascading repetition of pairs of bilabial and alveolar phonemes in line 2 (a pair of bilabial “m”s in “tumbled” and “rim” cascade into the alliterative pair of liquid “r”s in “rim” and “roundy, which overlap with the repetition of two velar nasal “n”s in “in” and “roundy”) mimic the tumbling motion of a stone falling down a well, each repeated sound giving way to a unique, musical “ring” though which each thing “fling[s] out broad its name” (4). Enjambment, as in lines 2-3, accommodates for lines that cannot be contained by the constraints of the precise sonnet form; they too “flame out” and spill over into the following line. Hopkins terms the vigor at the essence of all of God’s creations “instress.” By the OED’s definition, instress is “the force or energy which sustains an inscape” (“instress”). Inscape is “Hopkins’s word for the individual or essential quality of a thing; the uniqueness of an observed object, scene, event, etc.” (“inscape”). In a letter written in Feb. 1879, Hopkins himself writes, “it is the virtue of design, pattern, or inscape to be distinctive” (97). Bearing witness to brief eruptions of vitality, like those depicted in the first quatrain of “As kingfishers catch fire,” comprise moments when one experiences the instress of things, when God’s creations “Act in God’s eye what in God’s eye he is,” and express and realize their beauty and uniqueness. Brown, Daniel. “Victorian Poetry and Science.” The Cambridge Companion to Victorian Poetry. Ed. Joseph Bristow. Cambridge: Cambridge University Press, 2000. Print. Collins, Thomas J., and Vivienne J. Rundle. The Broadview Anthology of Victorian Poetry and Poetic Theory. Toronto: Broadview Press Ltd., 1999. 1049. Print. Hopkins, G.M. “As kingfishers catch fire, dragonflies draw flame.” Poems By Gerard Manley Hopkins. Ed. Robert Bridges. London: Humphrey Milford, 1918. pp.54. Print. —. “Author’s Preface.” Poems By Gerard Manley Hopkins. Ed. Robert Bridges. London: Humphrey Milford, 1918. pp. 1-6 Print. —. “Preface to Notes.” Poems By Gerard Manley Hopkins. Ed. Robert Bridges. London: Humphrey Milford, 1918. pp. 94-105. Print. —. “God’s Grandeur.” Poems By Gerard Manley Hopkins. Ed. Robert Bridges. London: Humphrey Milford, 1918. pp. 26 Print. “inscape.” Def. 1 Def. 1. The Oxford English Dictionary. 2013. OED Online. Web. 21 Nov. 2013. “instress.” Def. 1. Def. 1. The Oxford English Dictionary. 2013. OED Online. Web. 21 Nov. 2013. “kingfisher.” Def. 1. The Oxford English Dictionary. 2013. OED Online. Web. 18 Nov. 2013. “running rhythm” Def. 1. The Oxford English Dictionary. 2013. OED Online. Web. 18 Nov. 2013.